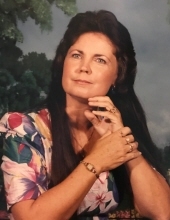 Betty Lou Scarbrough Thomas, 72, of Angleton, Texas died Friday, January 18, 2019 at Kindred Hospital in Sugar Land. Betty was born October 1, 1946, in Sugar Land, Texas to Lonny Richmond Scarbrough and Ivory Mae Fults Scarbrough. She was preceded in death by her parents, brother, Lonny Scarbrough and sister, Vera Mae Risinger. Those left behind to cherish a lifetime of beautiful memories are Doyle Peters, her best friend and true love, her children, Vernon Risinger (Verna), Barbara Davis (Jeff), Daniel Risinger (Shelley); grandchildren, Hannah, Rachel, Jr., Justin, Cody, Laci, Camryn, and Emily; great grandchildren, Jayse, Draven, Alerique, Jailianna, Dakota & Addie; brother, Willis (Sonny) Scarbrough. The family will greet friends from 10 am until 11am on Wednesday, January 23, 2019 at Baker Funeral Home in Brazoria. The funeral service will begin at 11 am also at Baker Funeral Home in Brazoria with burial to follow at Brazoria Cemetery. To plant a tree in memory of Betty Lou Thomas, please visit our Tribute Store.